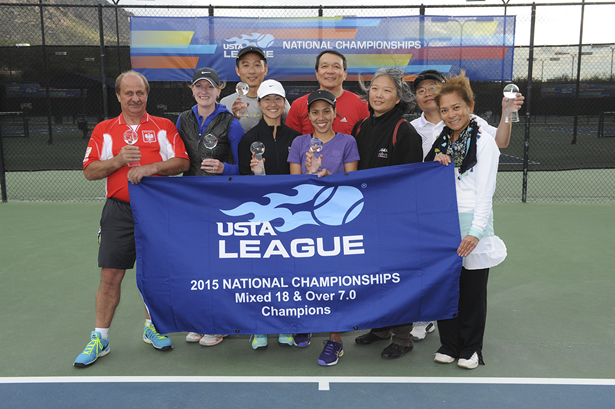 TUCSON, ARIZ., NOVEMBER, 15, 2015 – A mixed tennis team from Wilmette, Ill., representing the USTA Midwest Section, captured the national title at the USTA League Mixed 18 & Over 7.0 National Championships held at the Hilton El Conquistador Resort, Tucson, Ariz. The Wilmette team defeated a team from Caguas, P.R., 2-1 in the Championship match. Earlier in the day, the Wilmette team defeated a team from Pelham, Ala., 2-1 in the semifinals. They advanced this far by winning their round-robin flight contested Friday and Saturday. The team is captained by Sidhartha Tan and features Jozef Slaby, Alison Sarah Donnelly, Maerry Lee, Marialin Lomongo, Huan Chang, Remenisa Masa, Eric Ho, Duan Chen. The team plays at Centennial Tennis.